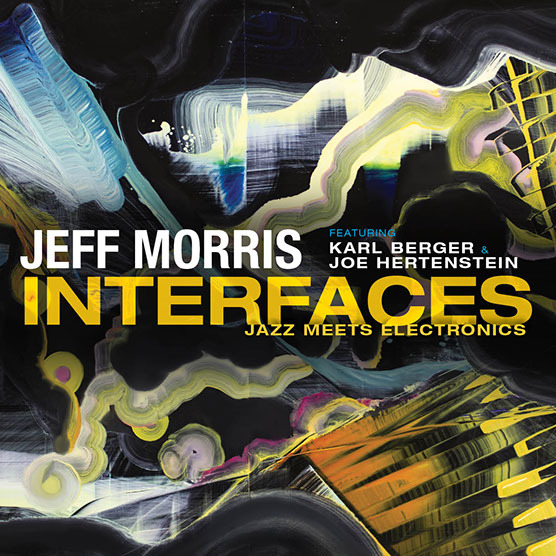 Jeff Morris sent us a copy of Interfaces; Jazz Meets Electronics (RAVELLO RECORDS RR7998) from Texas. Morris is interested in engaging audiences in the venues he visits with installations, lectures and performances, bolstered by his own publications – with the aim of creating “experiences that pop audiences’ minds out of the ordinary”. Presumably in the same adventurous spirit, Interfaces is presented here as an exploratory experiment, finding ways to insert computer processes into jazz ensemble playing, while still remaining true to computer language. Morris does the live sampling himself, and he’s recruited jazz/improv veteran Karl Berger from Germany on piano and vibes, plus fellow German drummer Joe Hertenstein. I think the process that’s relevant is that the computer / samples (also called live electronics on the press release) are not attempting to imitate the sound of a musical instrument, nor is Morris playing “jazzy” melodic lines like Chick Corea did when he embraced synthesizers for his (highly commercially successful) jazz-rock project Return To Forever. Instead, Morris creates crazy non-jazz noises, and the two jazz players must use these interventions as best they may. The hope is that the computer patterns will influence the performers, shaping what they do next in an unpredictable manner. I might also add that what we hear is nothing like the rash of EAI music that was prevalent from about 2000 onwards, when laptops, iPods and portable samplers were brought into free improvisation performances. Four pages of notes provided in the enclosed booklet will explain more of Morris’ intentions, and how he arrived at this unusual juncture, which he describes as a series of “interactive encounters with the jazz world”, and though he cites both Ornette Coleman and Brian Eno as possible influences, it’s likely that his experiment is about something more than just creating an album of tunes, and he wishes to demonstrate an entire world of possibilities and connections. The cover artworks, painted by April Zanne Johnson, provide something of a visual analogue to the morphing aural phenomena that are taking place. I’m warming to this record now, which is a good development since it seemed a rather indigestible hotch-potch on first spin. I don’t say that Morris is a particularly bold experimenter, but there are subtleties and twists layered into the grooves, and this is an unusual record. From 6th October 2018.